Eulogies walk the delicate line between the indie rock and the ever-dreaded “emo” subgenre. Compared often enough to bands like Death Cab for Cutie, Eulogies rarely break out of that mold lyrically. 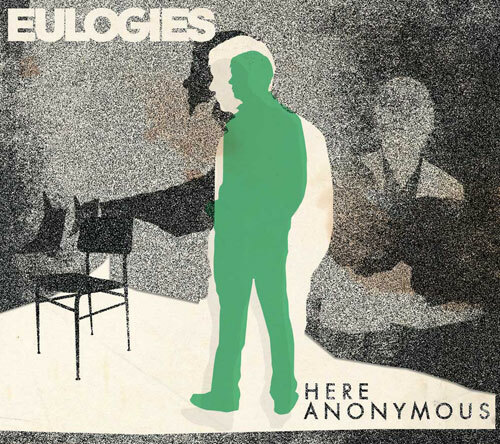 Although the full-length album, Here Anonymous, doesn’t have enough monotony to throw at the bottom of the review pile, Eulogies fail to stand out amongst a sea of bands in the same genre. The sweet and tender guitar lines are endearing but not challenging enough to build buzz. The Los Angeles band has been performing with their current line up since 2006, and Here Anonymous is their sophomore release. Unfortunately, this record is pleasant, but nondescript. While fun at points to sing along to, with a prime example being the track, “Eyes On The Prize,” it’s not brilliant. It seems as though it lacks a mission statement. It’s music for the sake of music, which is important, but in an oversaturated market, there needs to be more envelope-pushing, and Eulogies need to be more than just a nice band to see in a bar downtown. There is nothing significant to mention about the disc and no hook of any real note. And when a writer struggles to find something of interest to mention, that is a bad sign. Perhaps it’s a personal thing to ask for a record to be more than just “nice”; here’s hoping that Eulogies take it up a notch on their next effort. Flatcolor Limited Edition Ego Print!